BILL releases fourth punk-rock record ‘The BILL Album’ | Sonic Smash-Music! Veteran rockers of the experimental and punk rock scenes BILL have released their fourth studio album, “The BILL Album.” The full-length record contains 13 original BILL tracks for an approximate total listening time of 34 minutes. It has been proudly published as an independent release without the involvement of the corporate music industry on the Grasshopper record label. Eclectic, kaleidoscopic, and more than a little brilliant, “The BILL Album” proves that after 30 years, BILL still have what it takes to draw crowds from miles away. This is easily heard on “MonsterRock Band,” “Pucky Pucky,” and “La-La-Lies,” among others. This isn’t the only trick up Bill Gage’s sleeve, either. His performances have a practiced, yet improvisational quality which persists even in BILL’s studio recordings. Sometimes he speaks into the mic, sometimes shouts, sometimes croons, sometimes screams, sometimes growls, sometimes vocalizes in surprising, inimitable and indescribable ways which add to the experience of hearing BILL unlike the performance of any band member in recent memory. 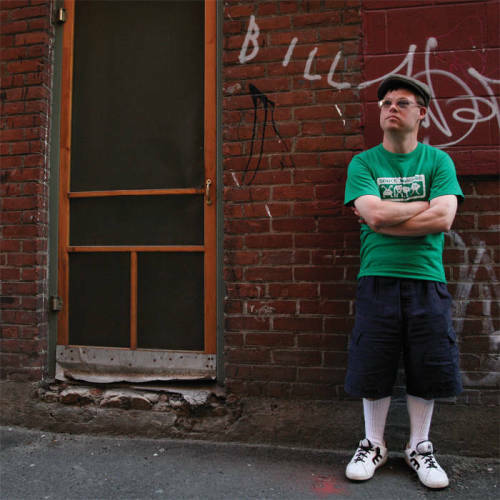 BILL are considered the first band in history to include a key member with an intellectual disability. “The BILL Album” by BILL on the Grasshopper label is available from over 600 quality digital music stores online worldwide now. Get in early, punk and experimental rock fans. Very early. This entry was tagged bill, down syndrome band, down syndrome punk, first musician with ds, musicians with ds, the bill album.